Day 4: we boarded the bus bright and early for the 3 1/2 hour ride to Marrakesh. 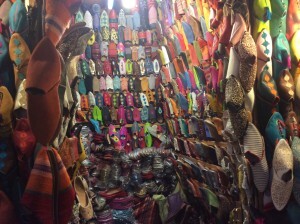 We quickly dropped our bags at the hotel, met our guide and headed to the famous souks of Marrakesh. 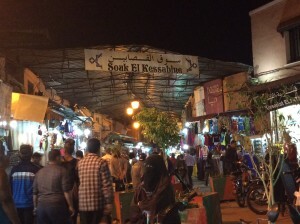 A souk is an open air marketplace, and the souks of Marrakesh are the largest in Morocco. They are laid out in a labrynth of alleyways according to the commodities that are sold. 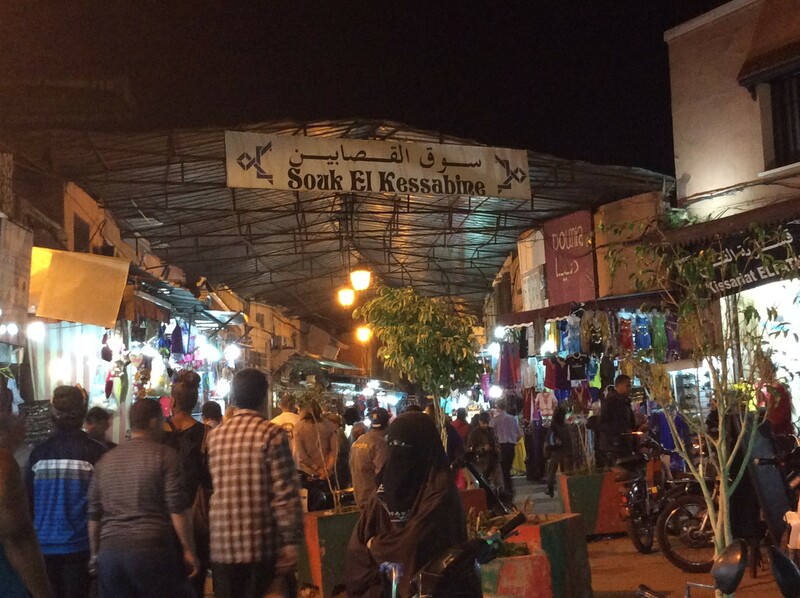 We drove past the minaret of the Koutoubia Mosque which marks the beginning of the souks, disembarked and began our journey into the exotic maze of markets. Lunch was first on the agenda. As in most of Morocco, behind the most unsuspecting doorways lies the most beautiful hidden treasures. The Cafe De Jardin was no exception. We literally had to duck our heads to enter through a small wooden door into a beautiful courtyard filled with flowers, birds and even orange trees. The food was as amazing as the setting. Besides our choir tour, we had another grand event to perform, a wedding. Marc Antoine and Desiree would be married in Marrakech and Antoine’s family joined us from France for the festivities. The S.T.A.R.S. welcomed them with open hearts and harmonic voices, as we are prone to do, everywhere. 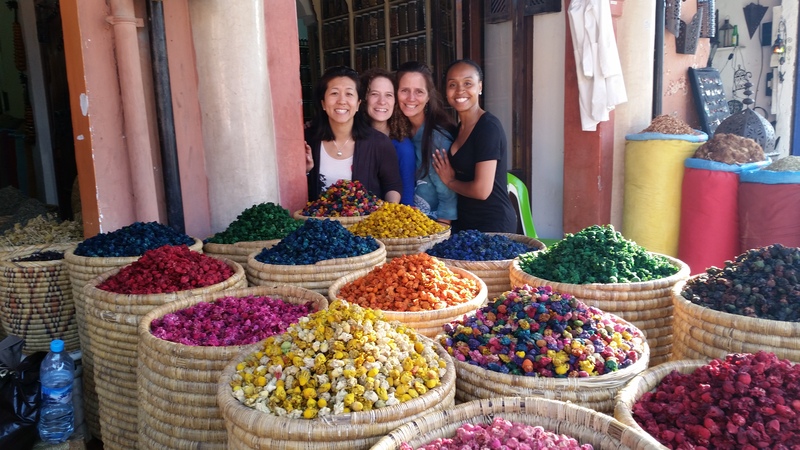 Now into the world of the souks and first stop – spices, my favorite. The spice shop was another example of the abundance of God. Rows and rows of herbs, spices, essential oils, teas, and medicinal concoctions; everything that could possibly be needed by the body. We rubbed on argan oils to make your skin and hair soft, sniffed nigella to clear your nose, smelled the aromas of spice combinations for exotic tagines and roasted meats, and studied tisanes used for detox and cleansing. Our shop attendant, with his great sense of humor, was educational and very entertaining in his presentation. We ended up singing for soap and lots of hugs and kisses. 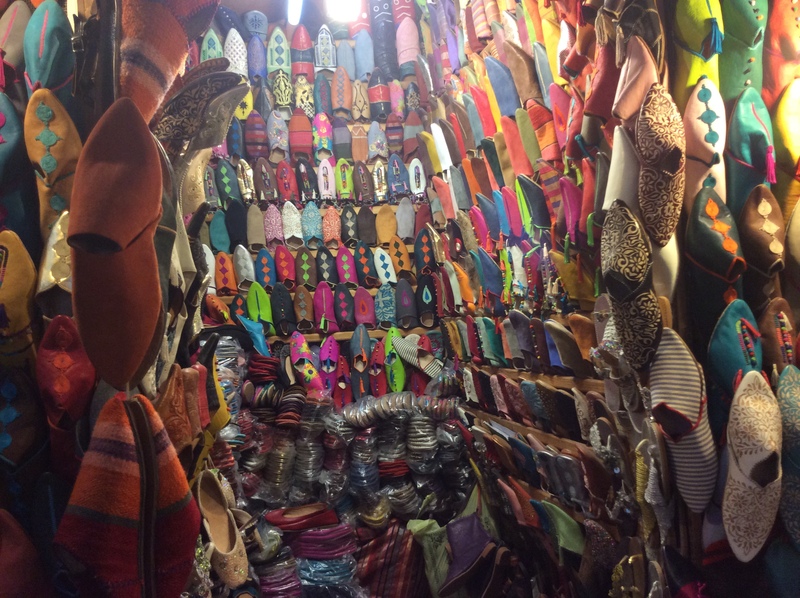 The rest of the day was spent exploring every inch of the souks; haggling for leather goods, ceramics, colorful shoes, hand-carved souvenirs, and of course, more olives. Tired but exhilarated by our day’s activity, we ended with a lovely meal and a little line dancing. Remember, our party never stops. Day 3: We assembled in an auditorium for the final event of the festival, a jam session with the other choirs. They taught us songs in Arabic and African languages, and we taught them the orchestra. S.T.A.R.S. also got the congregation up on their feet with “He Never Failed Me Yet.” Gospel music is a big hit in Morocco. No party would be complete in Africa without percussion instruments and dancing. A local band appeared on the stage and brought the house down with drums, harmonicas, Moroccan wind instruments and athletic dancing. No one was left in their seats as we congo-lined through the auditorium and danced hand-in-hand with our new Moroccan brothers and sisters. The world would be a very different place if everyone could just drop their stories and dance together. We couldn’t leave Casablanca without experiencing Rick’s Cafe, an iconic restaurant made famous by the classic Humphrey Bogart/Ingrid Bergman film. As we entered the building, it was like stepping into the movie, complete with live jazz, Moorish arches, mosaic floors, and a classy bar. After the band played their classic jazz set, we could not resist singing a little Gershwin in front of the piano. 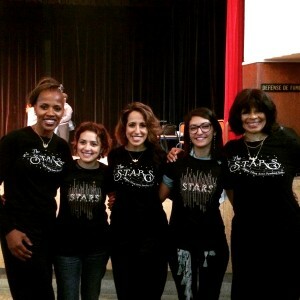 The owner, an American woman, was so thrilled she asked permission to use S.T.A.R.S. for publicity for the cafe. Who knew we would become part of Casablanca history? Back on the bus, we managed a full day’s tour in about 3 hours. We visited the third largest mosque in the world, built in the 1990’s, to honor the current king of Morocco, Hassan II. You can imagine the opulence of the carvings, mosaics, and ceiling decorations that the Moroccan artisans produced to honor both their king and God. 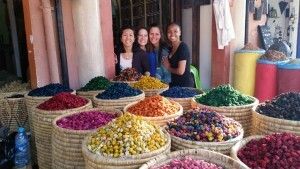 Then over to a small Souk (market) where it was evident that our relationship and bartering skills were in full effect. 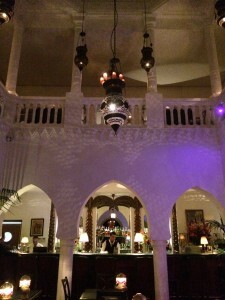 We found purses, Moroccan plates, candle holders, shoes, Moroccan coconut delights, and OLIVES! Winding our way through the Souk, a few of us stumbled upon the most glorious sight – a market square dedicated to olives – a staple in this part of the world. 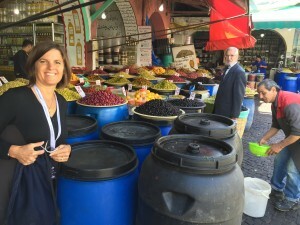 Barrels and barrels of green, black and red olives, pickled vegetables and preserved lemons lined this courtyard. We were overwhelmed with this grand demonstration of God’s abundance. The day finished with a fantastic televised concert from the Villa Des Arts of all the choirs. When we arrived at the Villa Des Arts, the place was buzzing with excitement. Chairs in the courtyard, a grand piano on stage, lights, and a beautiful building which graciously held over 100 singers. Standing on the front steps of the Villa, the S.T.A.R.S. moved through the harmonies of Gershwin and then brought down the house with the Hallelujah Chorus. In usual S.T.A.R.S. style, Natalie engaged the whole audience in the final Hallelujahs, leading them with her 1,2,3’s, until we became one integral, uplifted voice in praise to God. Just like in the Medina, races and cultures bonded through the common heart of humanity in song.